On 30 September 2014, the Group has successfully acquired the Land “珠玑巷”in Kaifeng. 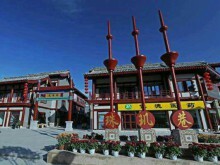 The Land is located in Kaifeng Confucian Temple Street, East of Liberation Avenue, covering a land area of 9,388.3 square meters (14.1 acreage) and is intended for building the Hakka’s Symbolic Constructions, the 珠玑巷and守望閣. On 18 October 2014, the 27th World Hakkas Assembly was ceremoniously held on the site, with the present of over 2,000 Hakka people and fellows from 19 countries and regions, the Assembly was held with great success and achievement.